It is not all about writing books! We still have to commit ourselves to ongoing investigations into UFOs, even if they are from the 1970’s! So, along with our investigations, and as part of our marketing plans, we drove down to Marlborough in Wiltshire on Saturday 12th May 2012. We stopped for a cup of tea, and placed some business cards in various places along the High Street, as well as in the front of what had once been the Old Fairy Shop. It is now Susi Watson’s shop selling high quality interior furnishings. Our placement here cost us £5 for four weeks, but we considered it to be well worth it, as this delightful small town is well frequented by the tourists. Then we drove to Avebury, where we dropped a free copy of Volume 4 to Esther Smith, manageress of the Henge shop, hoping that she may be inclined to start stocking the series of Haunted Skies. Fingers crossed. 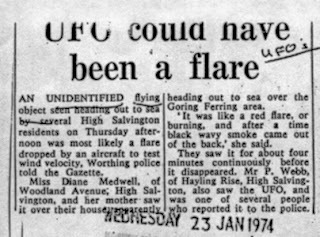 Then we travelled on to Chitterne, in the middle of Salisbury Plain, Wiltshire 2703 where we interviewed a witness who told us of a remarkable event that happened in the Summer of 1977, involving the sighting of a UFO over Cley Hill Farm. The incident was to leave his Aunt Janet’s face tanned through exposure to the object. On the following morning, the family found a small burn ring in the lawn and brickwork damaged and burnt. A group of officials arrived and advised the head of the household ,who went out to see them, that they were not to tell anyone about what had taken place. 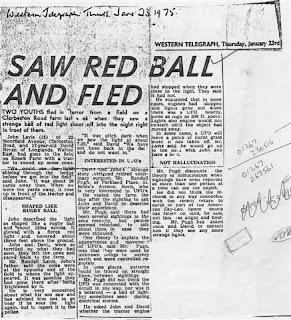 However, with the death of the parents, the story has now been told. A full report will, of course, be contained in Volume 6 if we can get the events of 1977 into that particular volume. We made our way to the Barge Inn in Honey Street, where they are rebuilding the barn, and also left some cards there. We spoke to Terry, one of the representatives of the Barge Inn, who indicated a willingness to stock some of the books in due course, but we shall see…….time will tell. We made our way to Cleeve Hill just outside Cheltenham, and walked along the hill to the top as we wanted some shots of the Aerial Transmitters. 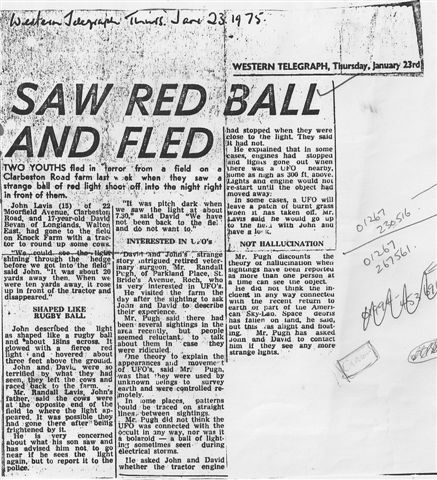 This was the scene of a remarkable sighting involving Police Officers in the summer of 1975. After this we walked back down gingerly avoiding cow packs and sheep muck! We took some delightful photos of the sheep and lambs. Volume 5 (1972-1973-1974) is nearly completed and we await seeing Jon Downes to finally finish. Hopefully it will be next week, depending on whether he is able to see us, but if not it will go via the email service. We need to see where we stand with the script for the next volume, which will be 1975, 1976 and maybe 1977. If anybody has any reports or sightings they wish to bring to our attention now is the time to tell us so we can include them. We are also reminding people that if anyone takes photos of HM Queen can they please let us have them so we can include them in the forthcoming Silver Jubilee edition of Haunted Skies, that will cover the 1977 period. We would also like to know if someone could advise us how to write ourselves up on Wikipedia; our illustrious leader is on there and he looks great! One final request please. We are struggling for illustrators; Steven Franklin is doing very well, but we don’t want to overwork him! Our other illustrator, Wayne, is off line at the moment due to his PC being rebuilt. So, if anyone would like to send us an example of their work we would be happy to consider it. If we like it we would be delighted to include it in the book alongside the originals, but we cannot, unfortunately, pay people. However, we hope that the opportunity of getting some work into the books, with - of course - our recommendations will suffice. “I appreciate your dilemma: It is difficult to get anyone in the mainstream media to take much notice of a serious study of UFO activity. 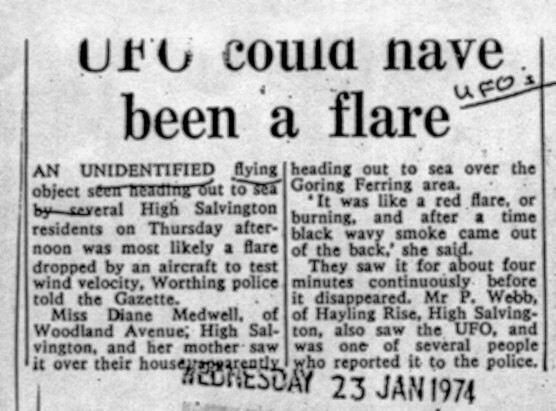 Although most national newspapers, including my own, the Daily Mail, do report credible UFO sightings, (and indeed we even report foreign sightings on Mail Online, which is the most visited newspaper web site in the world), there is a rarely much follow-up. This is for the obvious reason that there usually is nothing more to report; a UFO is here one minute, gone the next. And in many cases, if not the majority, trained observers such as police and military witnesses are reluctant to be publicly identified. In addition to that, it is a sad, and uncomfortable fact, that serious researchers such as yourselves are often undermined by an obsessive minority - crackpots, unfortunately, who flood us with wild theories and unverifiable 'facts' and irrelevant history whenever a sighting is reported. I don't know why your books have had such little media attention, but I can tell you that literally dozens, if not hundreds, of books are published every week, and books editors of newspapers don't have the time to read all of them. Indeed, they tend to only be able to concentrate on the books that are brought to their attention by PRs employed by the publishers. This isn't a firm policy, by any means, but it isn't a case of the media wilfully ignoring books such as yours; it is a matter of going with what has been deliberately, if not aggressively, targeted at them. Are you paying more than $5 per pack of cigarettes? I'm buying high quality cigarettes over at Duty Free Depot and this saves me over 60% from cigarettes.